Late life is characterized by great diversity in memory and other cognitive functions. Although a substantial proportion of older adults suffer from Alzheimer’s disease or another form of dementia, a majority retain a high level of cognitive skills throughout the life span. Identifying factors that sustain and enhance cognitive well-being is a growing area of original and translational research. In 2009, there are as many as 5.2 million Americans living with Alzheimer’s disease, and that figure is expected to grow to as many as 16 million by 2050. One in six women and one in 10 men who live to be at least age 55 will develop Alzheimer’s disease in their remaining lifetime. Approximately 10 million of the 78 million baby boomers who were alive in 2008 can expect to develop Alzheimer’s disease. Seventy percent of people with Alzheimer’s disease live at home, cared for by family and friends. In 2008, 9.8 million family members, friends, and neighbors provided unpaid care for someone with Alzheimer’s disease or another form of dementia. The direct costs to Medicare and Medicaid for care of people with Alzheimer’s disease amount to more than $148 billion annually (from Alzheimer’s Association, 2008 Alzheimer’s Disease Facts and Figures). 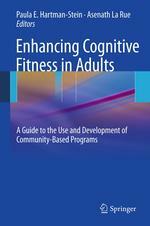 This book will highlight the research foundations behind brain fitness interventions as well as showcase innovative community-based programs to maintain and promote mental fitness and intervene with adults with cognitive impairment. The emphasis is on illustrating the nuts and bolts of setting up and utilizing cognitive health programs in the community, not just the laboratory.